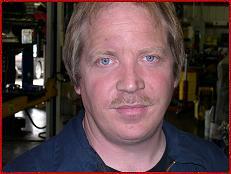 Jeff, a natural born leader, is the Lead Technician at F&F. He does it all; transmissions, clutches, cylinder heads, timing chains and belts, maintenance service, alignments and even filling in at the service desk. He tackles any task requested and can really pump out the work. Jeff has a "knack" for expediently and competently repairing cars. He comes to work everyday with a "go to" positive attitude that is infectious and extremely productive. He is a tremendous resource for other tech's in the shop. He is also the owner and caretaker of the shop mascot, Toby, a goldfish. Prior to F&F, Jeff managed a Chevron service station for many years developing his own loyal customer base. Upon the owner's retirement, Jeff approached F&F for a job because of their reputation. He has been with them for the last 6 years and is a huge asset to the company. Ed and Amy are thrilled and grateful to have him as a consistently productive team member. Jeff enjoys spending time with his wife Ginger, their 2 daughters, Katie and Samantha. Jeff is looking forward to spending lots of time on their boat with the kids this summer. He is an outdoors man who enjoys hunting, fishing for halibut in Alaska, and bowling with friends.